5th Annual Shelter Food Drive is here! This holiday season, don’t forget about our shelter pets! Regional Animal Shelter on West Fulton Street in Gloversville and will be asking for specific donations that the shelter needs. 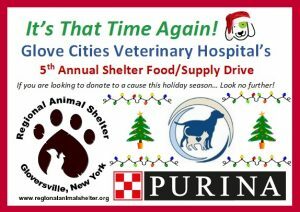 Glove Cities Veterinary Hospital will also be partnering with Purina, if we get at least 30 donations they will donate an additional 100lbs of food!